Visitors will have an opportunity to watch our rhino keepers engage with one of our rhinos. Learn why rhino training is an important part of daily rhino care. Daily Presentations run Memorial Day thru Labor Day. 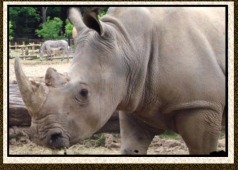 Public viewing of this presentation will be from the “Rhino Overlook” located on the boardwalk in Africa!